To keep up with updates to the FOA Guide, sign up for the FOA email newsletter or follow us on Facebook, LinkedIn, Pinterest, Twitter and YouTube. There is so much technical material on the FOA Online Reference Guide it can be overwhelming. If you are looking for a specific topic, we suggest you use our web site's Table of Contents and the site search (above) which will search the FOA website, FOA Online Reference Guide, FOA Newsletter, etc. to find relevant materials. 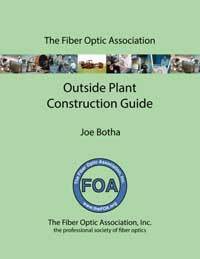 This is the FOA Online Reference Guide To Fiber Optics and Premises Cabling. It has been created by the Fiber Optic Association, Inc., the non-profit professional society of fiber optics, as a free service to the fiber optics and communications industries. Everyone can use this as a reference source for fiber optics and premises cabling. Students at FOA-Approved Schools can use this as a reference textbook for FOA certifications and those already certified can use it for a reference on the technologies or practices. The goal of this guide is to provide an extensive, reliable, non-commercial source of information on fiber optics and premises cabling (copper, fiber and wireless) for educating students, network users, designers, installers, etc. on the proper usage of fiber optic communications systems. In creating the materials, we considered the needs of many readers and attempted to provide for their special needs. Special types of users, e.g. MIL/govt, utility, industrial, FTTx, will find special sections covering the particulars of those applications and how that affects design, installation, etc. 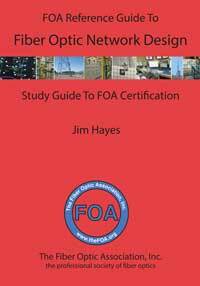 This reference covers the differences in fiber optic applications, e.g. communications vs. lighting or inspection, OSP vs premises, etc. to provide readers with knowledge about the varied applications of fiber in today's world. 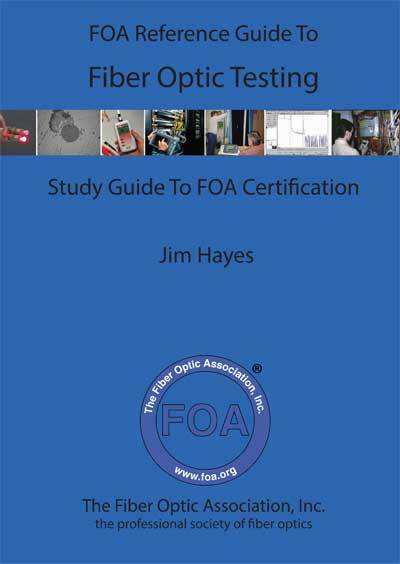 The organization of this material is chosen to make it appropriate for teaching fiber optic technology, manufacture, installation, design, testing and other related topics and to provide a reference for the FOA certification exams. As a reference book, the Table of Contents will allow anyone to find topics of interest. 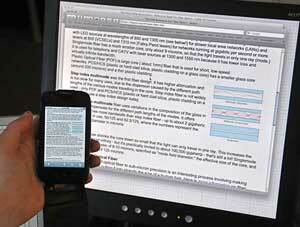 The Table of Contents is the master link to the material and is linked on every page. The format of all this material is simplified to allow fast loading with any browser and use on most mobile devices like this smart phone or tablet. Remember, as an online reference, this material is going to be expanded, and updated regularly to reflect changes in technologies and applications. It's always going to be incomplete, since we're always finding new things to add to it. It you have suggestions on how to improve it, contact us at info@thefoa.org. 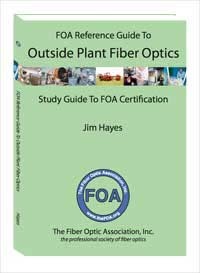 If you like printed books or read eBooks on your iPad or Kindle, we have several FOA textbooks to be used in training for FOA certifications and as reference books for contractors, installers and end users of fiber optics. Click on the book images for more information. The FOA has created a special FOA channel on YouTube, thefoainc, where we're posting instructional videos for everyone's use. We have videos on fiber optic cable preparation and, for those working on premises cabling, termination of UTP cable. Watch for lots more! 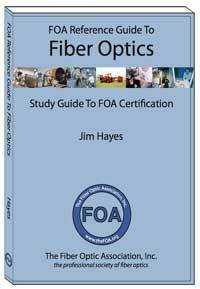 Fiber U offers free online self-study training and tutorials based on the materials from the FOA Guide. 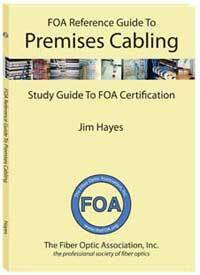 There are more than a dozen subjects, most are also preparation for FOA certifications. You can get certificates of completion for most subjects. The material has been produced and reviewed by a number of contributors whom we wish to thank for their work in contributing, creating and reviewing the materials included here: Jim Hayes, Editor, Reviewers: Bob Ballard, Joe Botha, Craig Bowden, Duane Clayton, Tom Collins, F. Douglas Elliott, Ian Gordon Fudge, Jorge Garcia, Bill Graham, Arnie Harris, Karen Hayes, John Highhouse, Ron Leger, Terry O'Malley, Eric Pearson, Jim Underwood, Chuck Vella, Steve Wolczak, Craig Getchel and many, many more. Note: This information is provided by The Fiber Optic Association, Inc. as a benefit to those interested in designing, manufacturing, selling, installing or using fiber optic communications systems or networks. It is intended to be used as a overview and/or basic guidelines and in no way should be considered to be complete or comprehensive. These guidelines are strictly the opinion of the FOA and the reader is expected to use them as a basis for learning, reference and creating their own documentation, project specifications, etc. The FOA assumes no liability for their use. Interested in linking to FOA webpages or reproducing FOA technical materials? Here is the FOA policy on use of our technical materials. The Fiber Optic Association is the international non-profit professional society of the fiber optic industry. Its charter is to promote professionalism in fiber optics through education, certification and standards. 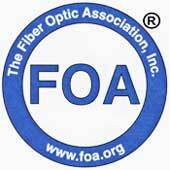 The FOA certifies CFOTs (Certified Fiber Optic Technicians) through approved training organizations worldwide. (C)2008-2018, The Fiber Optic Association, Inc.